Halloween is almost here, along with tummy aches and sugar rushes. Halloween treats for kids don’t always have to include sugar! 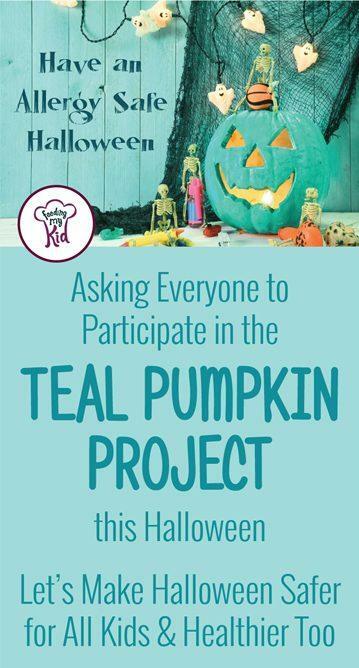 Why should everyone who celebrates Halloween participate in the Teal Pumpkin Project? Find out why it’s more inclusive for kids, safer and healthier. It also teaches kids one of the most important lessons, that fun is not exclusive to candy and sweets. By placing a teal pumpkin outside of your door, you’re telling families that your home will offer non-food related treats for children, which can include bubbles, small toys, erasers, pencils, stickers, plastic jewelry etc. Over 8% of all children have some sort of a food allergy, which can be anything from peanut, tree nut, soy, dairy to food coloring. These kids can often feel left out of celebrating Halloween since most of the candy handed out can be unsafe for them to eat and possibly even touch. Parents work so hard for these kids to live normal lives, yet it can feel very ostracizing for children who can’t participate in all the same ways as their friends during a holiday like Halloween. Imagine if everyone participating in Halloween offered non-food related treat options, like stickers. These kids would know they can safely enjoy the holiday like all the other kids. The excitement for kids and parents is in dressing up and going door to door with all the other kids. Now, all children could do it safely. Ever since my son’s diagnosis with a life-threatening peanut allergy, we have participated in the Teal Pumpkin Project. This also happened to be the year The Teal Pumpkin Project started. Each Halloween, I give kids the option of candy or a non-food related treat. I have noticed that almost all the children prefer the non-food related treats! They want the spider rings, bubbles, or stickers. These Halloween treats for kids are more popular than candy! It was great to see the trick or treaters get so excited when I offered them the option. I was truly surprised at how successful this was! Binging on candy has become a huge part of Halloween. Many parents are inviting the Switch Witch this Halloween. The Switch Witch, much like Santa and the Tooth Fairy, is a creation by parents. This Witch leaves a gift in exchange for a child’s bag of candy. For a week or two leading up to Halloween, parents can tell children about the Switch Witch and ask them what they would like in exchange for their bag of candy. Make the switch and donate the bag of candy to our troops or give it away. Ultimately, try to get it out of the house to stop you from munching on the candy too. Why the Need for this New Trend? With two-thirds of all adults in the U.S. now overweight or obese and one-third of all children overweight or obese, why don’t we start changing how we celebrate holidays, including Halloween? Food culture in America seemingly glorifies overindulgence in foods that frankly are bad for us. It’s almost acrimonious to suggest not celebrating a national holiday with candies, cookies, and chocolates. I’ve seen my friends’ faces when I’ve broached this subject. Even the mere suggestion of not giving candy to kids on a holiday brings up shocked expressions reminiscent of the Temple of Doom movie when the man’s heart is ripped out. The horror! If we don’t do something now, 1 in 3 people in the US will have Type-2 Diabetes by 2050, according to a new report from the Centers for Disease Control and Prevention (3). Currently, 1 in 10 Americans have it now, so it’s a drastic increase. If you think this won’t happen to your child, don’t bet on it. Your child has a 33% chance of getting Type-2 Diabetes by 2050. Candy will not make or break your child’s fond memories of childhood. I repeat: candy, cookies and other sweets are not why your child will have fond memories of childhood. This doesn’t mean you shouldn’t continue celebrating holidays, I’m just suggesting celebrating holidays differently, including Halloween. If most of us participate in the Teal Pumpkin Project we will make it safer and more fun for kids with food allergies to celebrate Halloween and we can start changing our society’s over-emphasis on candy and sweets. By handing out more non-food related treats, our kids will only be healthier for it. Will you put out a Teal Pumpkin this year? Some stores are already selling a teal pumpkin such as Pottery Barn or you can purchase a craftable Pumpkin and paint it teal, which is what we did.